This October I visited Italy for the first time, including a delightful stay in Venice. The armory in the Doge's palace was such a special experience and I took a huge number of pictures for future reference. Of those one- and two-handed swords which were more parallel-edged and minimally tapered in profile--as opposed to the acutely tapered rapiers, sword-rapiers, and estocs--I noticed that some groups had a particular kind of tip profile: very angular and acutely pointed, in contrast to neighboring groups on which the tips tended to transition smoothly from edges to point and took a more spatulate shape. Some of these angular tips ended in reinforced or thickened points, and on some examples this reinforced point stuck out farther on its own, giving the overall tip a kind of "ogee arch" profile. If the sword has a flattened hexagon cross-section, it transitions into a flattened diamond towards the tip in order to support the reinforced point. I saw it on various kinds of swords, including late 15th century side swords, large longswords, and Renaissance two-handers. The large longswords (perhaps you could also call them small, cross-hilted, two-handed swords) seemed particularly prone to this point section. On the other hand, there were some sets of spadone with acute, reinforced points, and others just a case away which had what I thought of as "regular" points. I don't know the details about how the Doge's armory maintained all of these swords from the Late Middle Ages to the end of the Venetian Republic, and I can only imagine that the present display incorporates swords that weren't necessarily kept together in their own time, but it also occurs to me that at least a portion of these weapons must have been kept ready for war for many centuries after they were made, and I can't even guess how many times they might have been re-sharpened, re-profiled, or otherwise modified from their original form after some kind of military fad. Was there a particular time when this point section was standard for newly made swords? If so, might old ones have been re-profiled to fit a more modern pattern or standard? 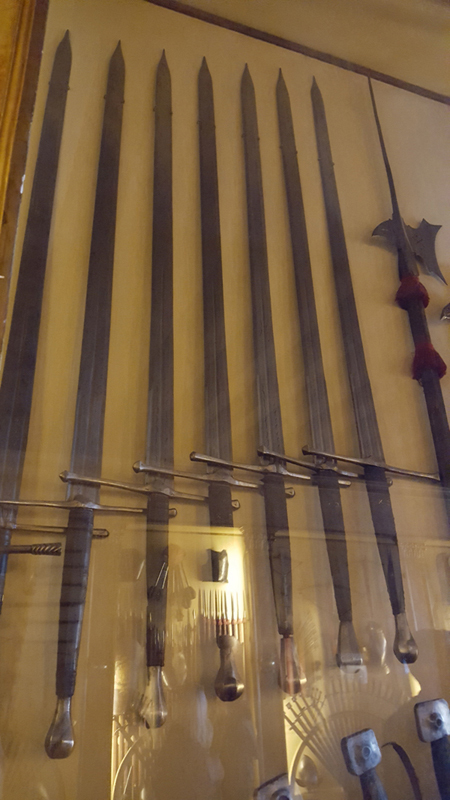 I was interested to note that the point on the Albion Doge sword is not like that on the examples in the Doge's palace, and wonder if that was a conscious avoidance of later modifications. Or have I got the wrong idea, and is this a point type that already existed in the 15th century? Detail of points on "Doge" side swords. Set of near-identical longswords or small two-handers with ogee points. Detail of point on large spadone. "This is a sharp medicine, but it is a physician for all diseases and miseries." I'm no expert but the same profile on all the sword tips to me could suggest an overzealous armorer at some point deciding to 'improve' all the blades. That reinforced tip makes me wonder if they were intended to catch and penetrate mail with a thrust. Pure speculation on my part though, I am curious to know from someone who knows for sure. 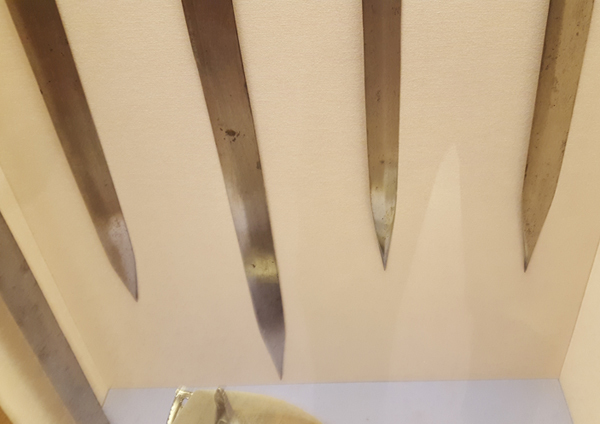 I already saw this kind of angular tips on parrying daggers of the late 16th and beginning 17th century... I never noticed there were swords shaped like this. Pretty interesting. Truly magnificent. I ask myself for what purpose the sidesword have a spike in the opposite side. By the way, aren't this two handers way too broad? By the way, aren't this two handers way too broad? Looks like they were searching for the best compromise between cutting and thrusting! Thanks, how did we overlook this? 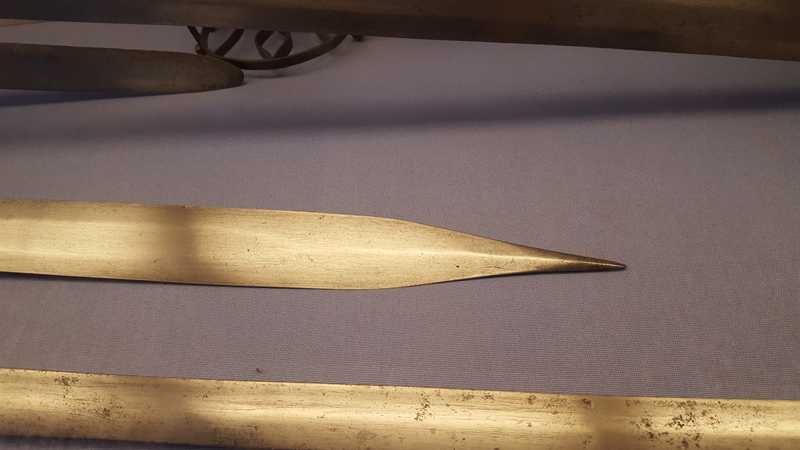 Seems like a great innovation: a traditional war sword with an awl at the tip. Only downside I can see is that tip cuts might tend to foul instead of slicing. The broad tipped great swords that were made for field use have extreme distal taper. The last eight inches or so are less than 1/8 inch thick. To quote Dr. Michael Lacey, it was like fighting with six foot razor blades. They tend to bow under their own weight if stood on their tip. I really like handling a proper field sword; they move MUCH faster than most people would believe! 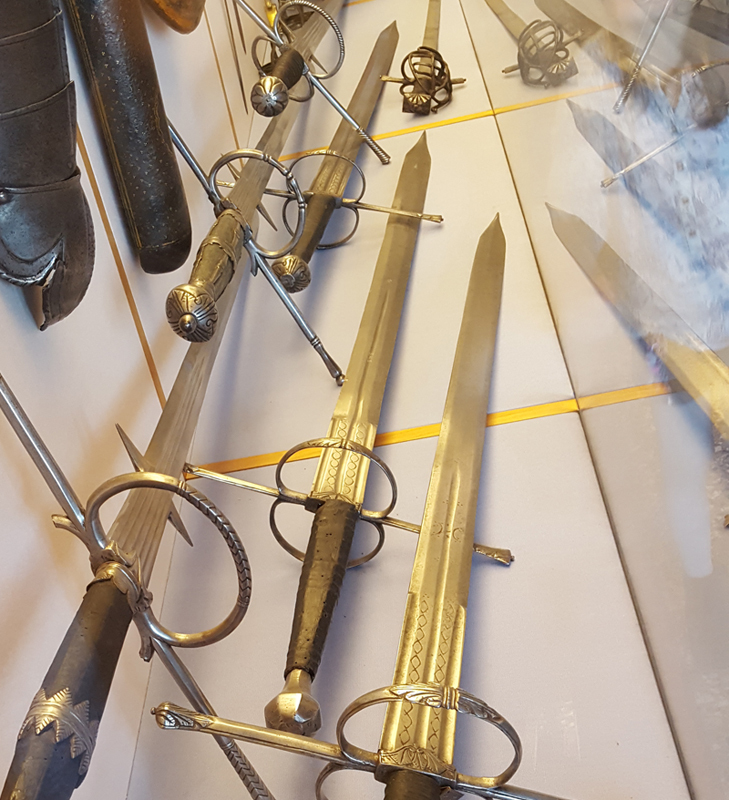 They often broke and were retipped; there are some very short great swords in Graz! Processional great swords have distal taper too, but not as much, which, combined with their greater length, make them much heavier. The broad tipped great swords that were made for field use have extreme distal taper. The last eight inches or so are less than 1/8 inch thick. To quote Dr. Michael Lacey, it was like fighting with six foot razor blades. They tend to bow under their own weight if stood on their tip. I really like handling a proper field sword; they move MUCH faster than most people would believe! 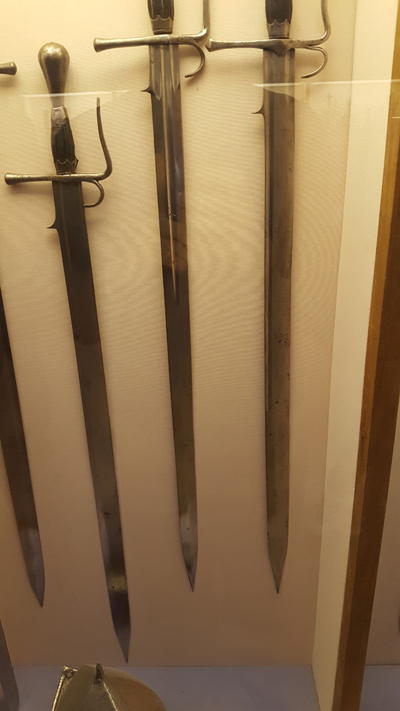 They often broke and were retipped; there are some very short great swords in Graz! Processional great swords have distal taper too, but not as much, which, combined with their greateer length, make them much heavier. So I think you're implying that the current designs would have to sacrifice either stiffness for the thrust or thinness for good handling, one can't have both.